I am thankful for random stop by Jaker at our house. I am thankful for savings and Gods gift of money to not be dictating our life and happiness. I am so thankful for bubbly McCoy who eats sand and is spooked by the drill. I am so thankful for openness between Josh and I like never before. I am so thankful for cookies and the drive in Josh that always has him working away!!! Oh how this morning’s SHEREADSTRUTH resonated, scared, moved me. Oh, my Lord God, my heavently Father and creator of the UNIVERSE. I plead my prayers are “more about your greatness than my weakness.” I pray my posture is the same in hope and sorrow as it is in thankfulness. That I am on my knees…. WORSHIPPING YOU. For if I am worshipping you, I am worshipping nothing else. It is as the word priority means… priority of one item. not 2 or prioritizing 4 things, but one. ONE GOD. The only God. The God and father of Jesus Christ who blasted our sin and death and renews us each minute of the day. Forgive me. THANK YOU for your massive moving and blessing My heavenly father. I miss you and long for you. I want you and praise you. Thank you for the gift of the bible to resonate so beautifully, so fully and so lowly. thank you. I long to be a mother. A mama. A mommy. Lord God, please do not forget me. Please create your loving presence into a little ruby or baby boy. I long to gift that THROUGH YOU to Josh. Lord God, in you I hope. Thank you for your peace and light, for sending the holy spirit and for giving us NEW mornings to worship you in. I bow in worship every morning when I wake up. I slap the alarm notification on my phone for the third time, silently and sleepily vowing to get to bed earlier tonight than the night before. When the second alarm goes off, also for the third time (I set at least two because morning and I are not buddies), I slap the screen again. This time I rub my eyes and keep them open. Then, I put the phone down and get up. Except, before I put the phone down and get up, I check my notifications. Relax! It’ll only take a minute! And as one minute becomes 10 or 20, I scroll through texts, emails, and social media, nonchalantly consuming whatever happens to flash on the screen. Before I step foot out of bed, I’ve set my heart and mind at the feet of my iPhone. I bow in worship every morning when I wake up. But sometimes I bow to the wrong thing. Maybe my tendency to distraction is why my heart is so drawn to Hannah’s story. I listened again to these first two chapters of 1 Samuel just this morning, and I felt a flutter in my chest as the chapters repeated. In only a few pages, Scripture describes Hannah praying again and again to the Lord, pouring out her heart, bowing in worship. 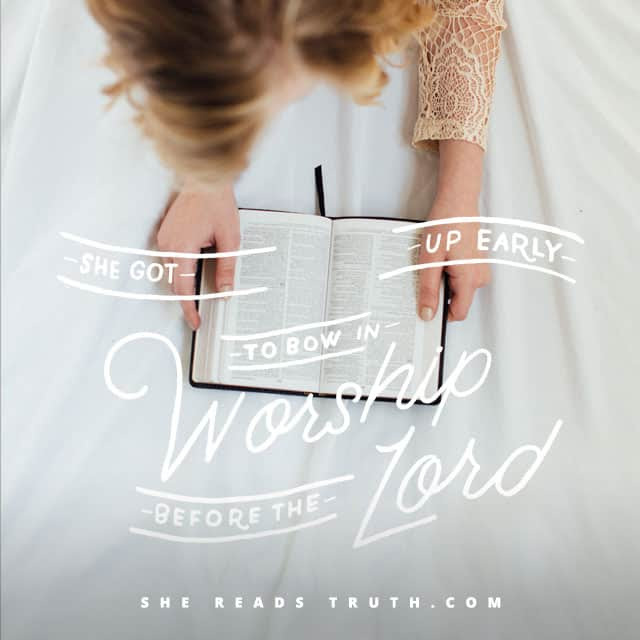 I’m sure she wasn’t perfect—but, oh, how she prayed! Hannah’s prayers were not obligatory, half-hearted, or empty. She prayed honestly and openly; she prayed as if her life depended on it. “Deeply hurt, Hannah prayed to the Lord and wept with many tears,” we read in 1 Samuel 1:10. “I’ve been praying from the depth of my anguish and resentment,” she said. From the depth of her anguish and resentment. The good, the bad, and the painful—Hannah brought it all to her God as an act of worship. In fact, she prayed so earnestly that a priest named Eli accused her of being drunk when he watched her at the tabernacle. “Hannah was praying silently, and though her lips were moving, her voice could not be heard” (1 Samuel 1:13). I like to pray out loud when I drive because I think anyone observing will assume I’m talking on the phone. Evidently, Hannah wouldn’t have given it enough thought to care. So what is it about Hannah that gives her the kind of worshipping heart I long to have? Why is prayer Hannah’s first resort instead of her last? The Bible does not tell us outright, but I think we’re given some solid clues. She believes in God’s power. Hannah approaches God with reverence (“Lord of Hosts, if you will take notice of your servant’s affliction…”) and she asks boldly for His blessing (“remember and [do] not forget me…”). She trusts in God’s goodness. Hannah offers her beloved son Samuel as God’s servant before he is even conceived (“I will give him to the Lord all the days of his life…”). My mama-heart can hardly imagine such trusting resolve. She rests in God’s presence. We get a glimpse of how Hannah responds in sorrow (“I am a woman with a broken heart… I’ve been pouring out my heart before the Lord”) and even how she begins her day in the midst of hard times of waiting (“Elkanah and Hannah got up early to bow in worship before the Lord”). Hannah’s habit of prayer was less about her goodness and more about God’s greatness. After Samuel’s birth, Hannah carried her son up to the tabernacle, dedicating him to the Lord. It’s here that we see her back where she started in Chapter 1: presenting her whole self in prayer before God. Though her prayers of anguish had become a song of thanksgiving, Hannah’s posture was still the same. In supplication and in praise, she bowed in worship before the Lord. I don’t honestly worship my inbox or my Instagram feed, but I do turn to empty distractions rather than turning my eyes to Jesus. I don’t truly believe prayer is pointless, but the opportunities I don’t take to bow before the Lord make me wonder. Oh, Lord, please forgive me for giving my worshipful glances and prayerful pleas to anyone and anything other than you! Sisters, we serve a powerful, loving, and good God—the God who is like no other. When our lives ache with need, may we bring them to the throne. When our hearts break, may we pour them out to God. When we rise in the morning, may we rise in worship. I am so thankful for sunshine, walks around the lake and a healthy joshers! I am so thankful for restoration in relationships. I am so thankful for easy conversation. I am so thankful for tears that break down tension and increase vulnerability. Lord God you know my heart. You know my thoughts. You know my obsessions and road blocks. break them down. break ME down. lift me up only through your love and strength! Thank you Lord God for my patience on my evenings alone. I can hear you moving and nudging me. Thank you. Thank you for blessing us with downtime and relaxation. We pray for you to bless us with a baby if that is in your will. Please ready our hearts and open our minds to the ways you are showing us how we will be a family! I am thankful for a husband that needs the cuddles like I do after a long weekend away. I am thankful for a husband that is TRULY happy with any food, meal plan, dinner, recipe or TAKEOUT. I am so thankful for Christy Brokens and her awesome example of love for Jesus in her heart and for her example in marriage! It was so wonderful seeing her! I am so thankful for gorgeous weather and an awesome Joshers. Sunday at the Principal charity classic was super! I am so thankful for beautiful weather today and a fun weekend ahead to look forward to with Erin!! I am so thankful for the chiropractor. I am so thankful for Joshs neck rubs and hugs. I am so thankful for good food and the interest in cooking. I am SO thankful for sunshine! I am so thankful for long healthy hair I dont have to wash for 4 days. I am so thankful for a God that calms my fears, relaxes my shoulders and prioritizes my days for me.